Anna is the youngest of a large Mennonite family that travels every spring from their home in Mexico to find farm work in Canada. The family’s situation is precarious and their living conditions barely adequate. Being too young, she cannot work nor go to school, and so she daydreams about what it would be like to live in just one place. 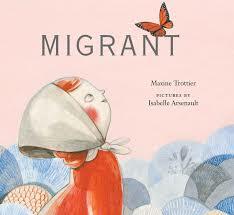 Maxine Trottier’s poetic prose and Isabelle Arsenault’s soft and imaginative illustrations give a whimsical feel to this rather harsh reality. The Afterward gives the adult reader the necessary facts to help teach the young listener about the rights of migrant workers. This is a different picture of who the migrant workers are. Who knew that there are blond, blue-eyed, German speakers among them? Thank you, Maxine Trottier, for reminding us that we should not assume or stereotype. Classroom Connections: This book is rich in social commentary, as well as in the use of imagery. It is a good starting point for older students studying the agricultural industry and how we get fruits and vegetables from the field to the store. The topics of poverty, social justice, working conditions and workers’ rights, rights to schools and education are also brought out. And there is Anna and her reactions to being in a different place and not understanding the people around her. The rich prose lends itself to exploring such terms as metaphor, simile, imagery and playing with these in language arts.